Rainboots are the most practical of shoe purchases. I bought these Steve Madden rainboots this year and wondered why it took so long to buy a pair. It's a gamechanger. I can stomp in puddles gleefully. And the orange stripe is super cute. But there is a problem. The longer I wear them, my feet seem to conform to the boot and it's nearly impossible to take them off. Even with the zipper! Yesterday I had both boots halfway off, but neither would come all the way off, which was debilitating, and I was starting to fret that I might have to call someone to help. After some persistence, I was finally free. Phew! So pluses and minuses to rubber shoes. 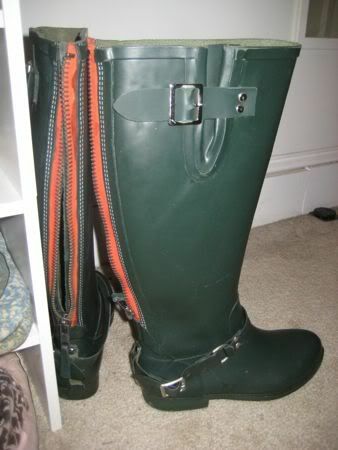 Are Hunter boots any better? Look, I got a shelf to get more organized. This is good and bad because now I have room for more shoes. Posted in Style and tagged with Rainboots, Shoes. February 22, 2011 by Adele Chapin.